Nathaniel Magruder was the son of John Magruder of Dunblane, and the father of John S. Magruder and of Elizabeth Magruder. Here is the family tree. I hope to post information from the estates of all who died before emancipation, tracking the movement of slaves and free blacks among them–including the Hall family (not shown here) with whom these Magruders were intermarried. Bold font shows Nathaniel himself, with his ancestors and children; plain font shows his siblings, nieces & nephews, and grandchildren. See pages in the Magruder-McGregor and Magruder-Hamilton clusters, as well as Descendants of Priscilla Gray. See especially the Interrelations page in the Magruder-McGregor group. 4. Alexander Magruder + ?? Many descendants, including Isaac Magruder, Staley Magruder, & all the Caleb Clarke Magruders. I will explore this family in future. 5. John S. Magruder 1767-1825 + Eleanor Hall (widow Clark) (see Magruder-McGregor pages) In 1820, he changed the surnames of all his living children to McGregor. Eleanor died intestate. 6. Alaric or Alerick M. McGregor + Martha Potts Key. Alerick was a school teacher; his will and inventory mention no slaves. 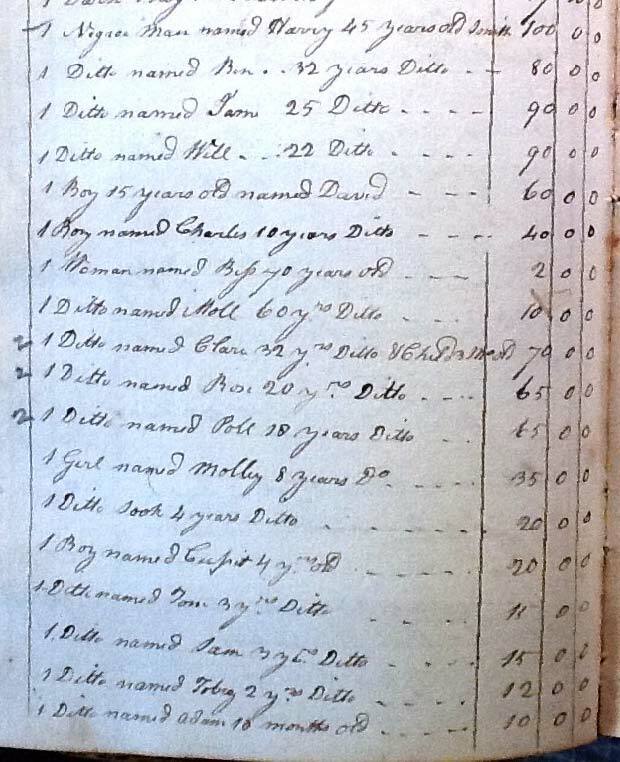 The inventory of Nathaniel Magruder’s estate is unusual in that it lists the contents of each room in the main house, as well as the slave quarters and outbuildings, giving an unusually detailed picture of life and material culture on his plantations. The entire inventory has been scanned and transcribed on Probing the Past, a project of the Roy Rosenzweig Center for History and New Media at George Mason University. Here is my snapshot of one page of the original inventory, giving the names of the enslaved. Names in this inventory: Harry 45, a smith ($100), Ben 32 ($80), Tom 25 ($90), Will 22 ($90), David 15 ($60), Charles 10 ($40), Bess 70 ($2), Moll 60 ($10), Clare 32 & child 3 mos. ($70), Rose 20 ($65), Poll 10? ($65), Molley 8 ($35), Sook 4 ($20), Cupit 4 ($20), Tom 3 ($15), Sam 3 ($15), Toby 2 ($12), Adam 18 mos.($10). In his will, Nathaniel left Rose to his daughter Sarah, and to Margaret he left a girl named Cate, not named in the inventory. Both Margaret Magruder and Sarah Magruder Shanley died intestate. I have not verified all details given on the family tree; I will update if I discover errors. My general sources are C.C. Magruder and Sue Emerson (see Sources pages for full citations) with verifications from the wills listed.